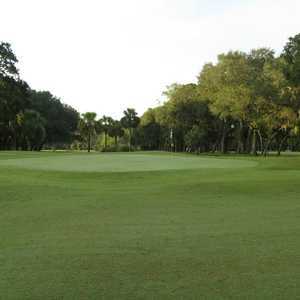 FERNANDINA BEACH, Fla. -- Fernandina Beach Golf Club is one of those rare courses where each nine is different. In this case, that means different times three. The seventh green on the South Course at Fernandina Beach Golf Club slopes to the front, possibly bringing a bunker back into play. The story of Fernandina Beach's municipal course goes back a long way, to 1956, with a single nine, now the North Course and the oldest on Amelia Island. It was followed three years later by another nine, the West Course, which was also designed by Head Professional Ed Matteson. 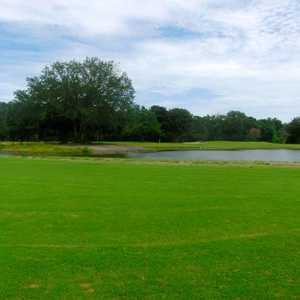 It wasn't until 1972 that the South Course was added, designed by head pro Tommy Birdsong. The three nines can't even agree on par. The North Course is a par 35 with only one par 5, the South Course is a par 36 and the West Course is a par 37, with an extra par 5. Their personalities don't mesh, either. The West Course is the most open -- and longest -- of the three nines. It includes a 607-yard par 5 from the tips, with just one bunker, and a 205-yard par 3 from the whites, also with just a single bunker. In short, there aren't a lot of hazards on the West Course, other than exhaustion from getting around it. The whites are 3,502 yards, while the tips are 3,683. The North Course is kind of quirky, and that's its charm. The first hole is a par 4 for men but a par 5 for women, who tee off nearly from the tips. Its par-3 third hole is one of the toughest of the 27 at Fernandina Beach Golf Club, depending on pin position. There is a knoll on the green that if the pin is anywhere near it, a ball never will be. You can putt and putt and that ball isn't going to sit close to the cup. I wonder if games have been called on that hole because of darkness? There are a few more bunkers on the North Course, but there's still plenty of room in the fairways. The greens vary is size and shape, but they are all are nice and smooth. The beauty of the North Course is the trees. Most holes run between rows of twisty, leaning specimens that capture the image of the Old South. There is even a slight hill on the North Course, a rise to get to the sixth green. The most creative of the three nines is the South Course, where each hole poses a different problem, from trees right in the middle of the fairway, like on nos. 1 and 9, sharp doglegs on nos. 2 and 5, or its two tricky par 3s. This nine blazed its own trail, not following golf convention. The greens are smaller, with none exceeding 30 yards, and many are pretty sloped. 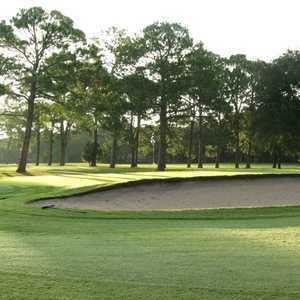 Beyond golf, Fernandina Beach Golf Club is a friendly, neighborhood-type course where most people know each other. Newcomers are made to feel welcome, too. The somewhat odd course also is getting a little sprucing up under its new management company, Billy Casper Golf. What that means is a better-stocked pro shop, a little higher level of service and some expert agronomy. What was already good is going to be even better.